The first things we did for the nursery was to buy some furniture! I picked the Davinci Jenny Lind Stationary Crib in Cherry . 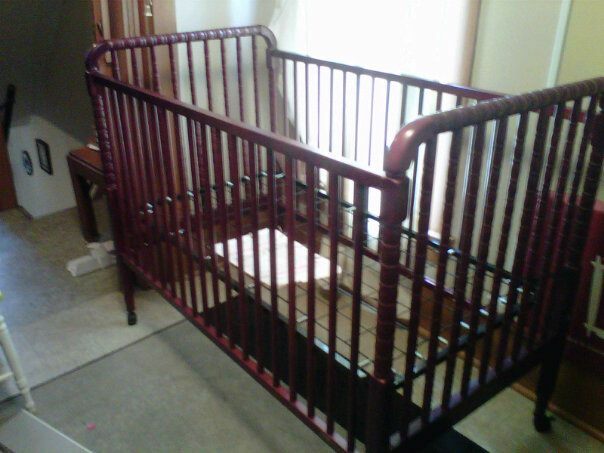 I had every intention of buying this crib from Amazon, but I found it at a local surplus store for $65 (score!!!). I splurged a bit on this dry sink (see left) bought at a local primitive store — but I supported local business so I think it was okay to splurge. 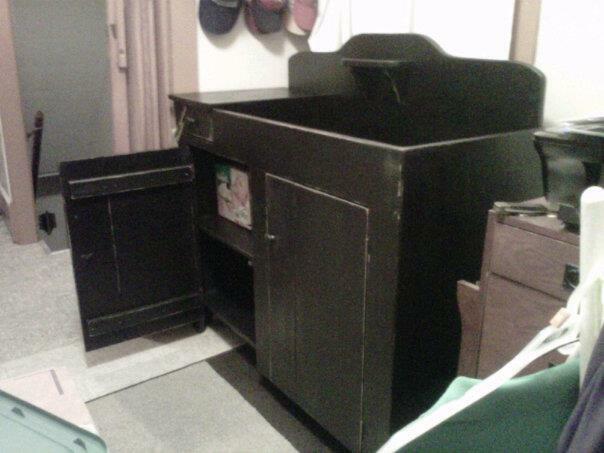 I plan to use this as a changing table and a dresser. I started making the rag quilt, following the tutorial by Jubilee Fabric. I’ve never made a quilt before. The most complicated sewing project I ever tried was making curtains for my son’s room. I think I’m doing a pretty good job! I am not using batting between the layers, because my baby is due in June and I do not want a heavy quilt. I am using mostly homespun fabric and a little bit of flannel fabric. I also started the crib skirt. I got Simplicity Sewing Pattern 9140 because I wanted a ruffly crib skirt and most tutorials I found online were for plain crib skirts. The pattern also includes many other crib accessories – I may try to make bumper pads from the pattern if I have time to make them. The crib skirt will be the red plaid fabric pictured above in the quilt. I have all of the pieces cut out and one end panel sewn on, which I got done all in one day! I have learned that I despise hemming, so I’ve started procrastinating a bit on the other sides of the crib skirt. Hopefully I can get some more done with it next week!